If you’re in the technology field chances are you’ve heard of Joint Application Design sessions, or JAD Sessions. This is a meeting where project team members get together with stakeholders to identify and document requirements for software applications. We’ve used these types of sessions in the past and have evolved our thinking to improve this approach. OneSpring developed the Joint Application Modeling (JAM) session as a new way to define software requirements. It uses visualization technology and real-time documentation to define better requirements in less time. 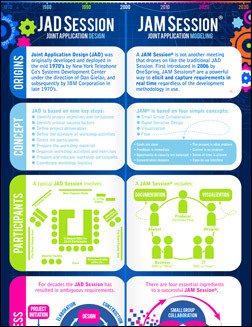 This infographic was created to show the difference between a JAD Session and JAM Session.